Find My Workspace lists over 95% of the serviced offices market in Jurong East. Simply click Request Quote to check pricing for one office, or Add to Basket for multiple offices. 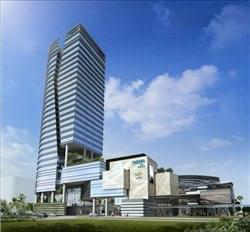 This business centre is part of a seven-level lifestyle and family shopping mall and 20-level prime office tower situated in the heart of Jurong Gateway. Multi-national banking, electronic and legal firms are all based in this state-of-the-art building. The business centre is fully equipped with high-quality ergonomically designed furniture, high-tech telecom and internet facilities, sophisticated meeting room and a high standard of services supported by the professional local team. This business centre offers a range of serviced workspaces, and is strategically located in the Jurong Lake District and enjoys easy accessibility to the industrial clusters in Jurong and Tuas. 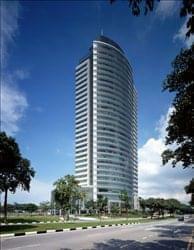 The 32-storey development is the ideal place for firms looking to set up their corporate headquarters in the West of Singapore. This fully furnished, modern office space contains state-of-the-art facilities for all professional clients to enjoy. Meeting rooms, reception services as well as a kitchen and break out area are available to all tenants; not only run their business efficiently but also feel comfortable in their working environment. A large sky terrace on the fifth level, exclusively office occupiers, features a fully equipped gymnasium, multi-purpose pavilion, fitness stations, event plaza, a jogging track and outdoor lounges. Clients will have unobstructed panoramic views of the lush greenery around Jurong Lake, coastal sea view, Bukit Timah Hill and the distinctive Singapore skyline. Designated bicycle parking spaces with locker and shower facilities are also available. To obtain information for your selected Jurong East Serviced Offices, please tick the "Add to basket" box for each office you prefer and complete the form below. We will then send a detailed report via email.